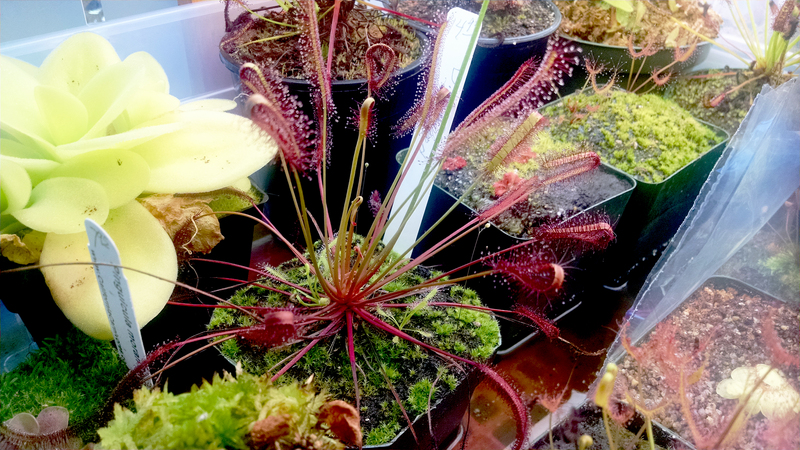 Drosera capensis red really knows how to flower |Sundews Etc. Every other day or so lately I get a real treat over in one of my trays. These flowers are a bit longer-lived than the typical form as well. Look at the size of that flower! 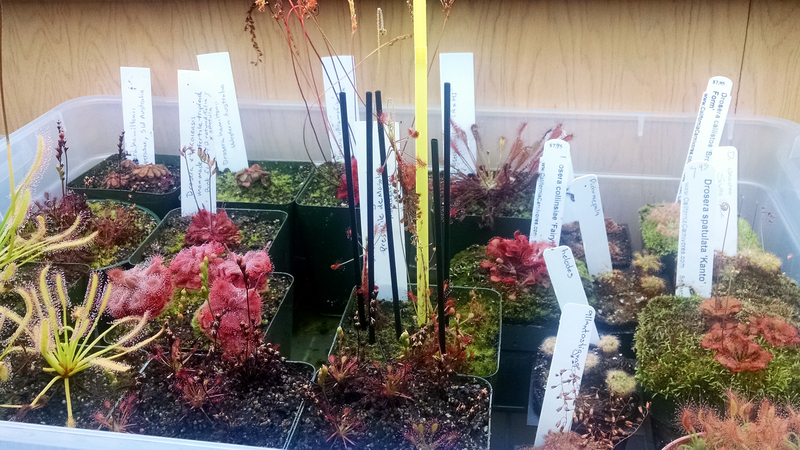 That's the Drosera capensis red form I picked up from California Carnivores back in July. The flower is half again as large as the flower on a typical D. capensis. 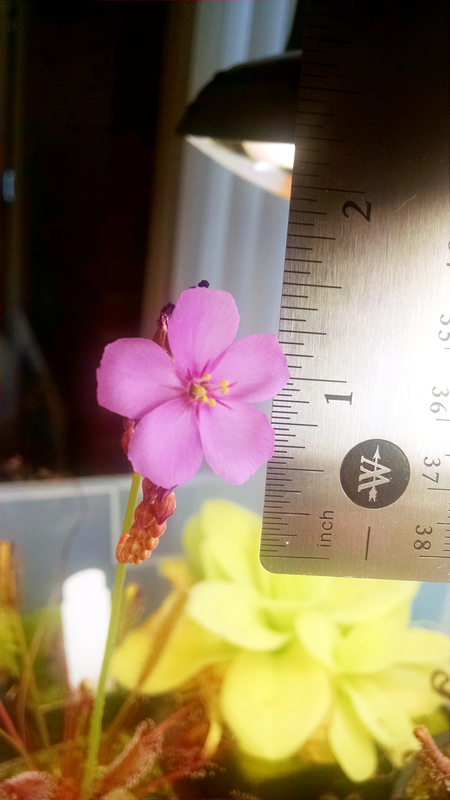 This is almost as big as my Drosera 'Marston Dragon' flowers. I've mentioned it before, but the red form of D. capensis is very morphologically distinct from the typical form. While D. capensis 'Albino' pretty much looks like the typical form except for the color, the red has a larger flower, longer petioles, and less hairiness, among other characteristics. Some people think it looks "stringy," but lately I've come to really like it. This is one of my favorite plants lately. It's not nearly as red as it could be right now, since I've been feeding it lately in order to get a nice seed set. The new growth takes a couple weeks to get that deep red color, and if you feed it regularly it'll replace the leaves too quickly to get properly red. But that flower is just so cheery in the tray. 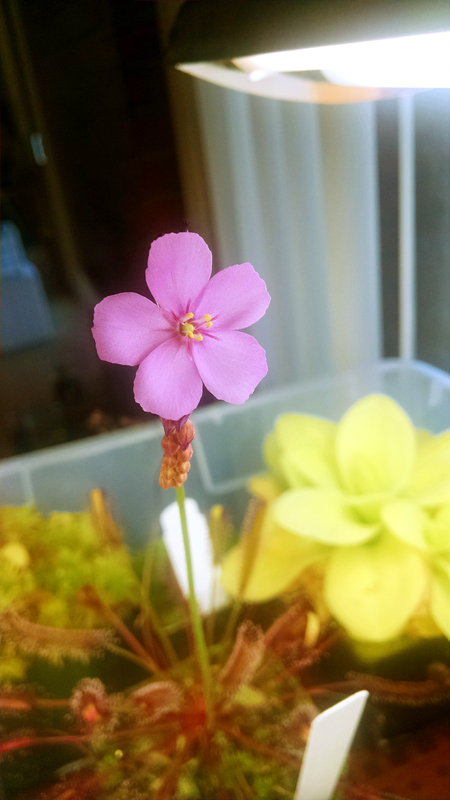 It's nice having a big flower show now that my Pinguicula gigantea has stopped blooming. I can see it from across the room. 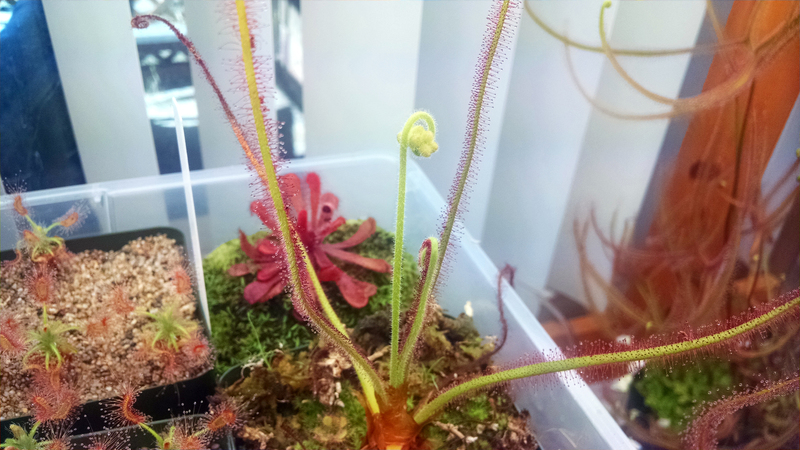 In other exciting bloom news, my Drosera spiralis flower stalk is developing nicely. A very neat and upright flower stalk. Exactly what I would expect from such a dignified species. I think the plant really appreciated being fed. I'm gonna give it another heavy feeding once that new leaf unfurls. 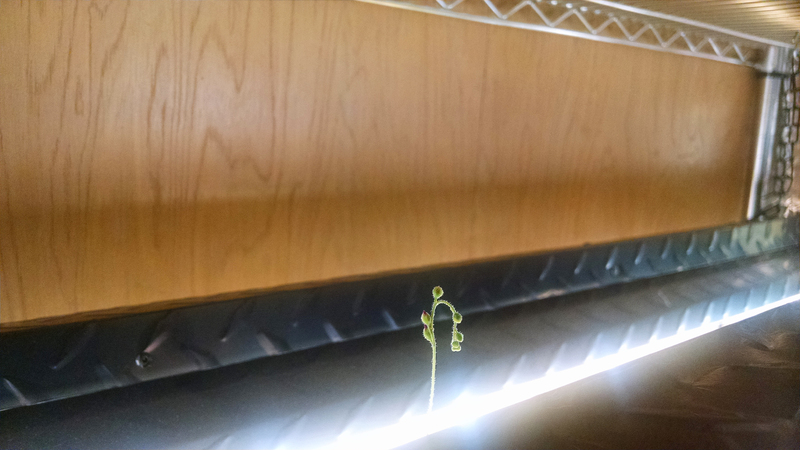 Also, it's a bit hard to see, but my Drosera madagascariensis is blooming happily, and the extra straws have provided enough support to keep it upright. It's a bit chaotic in here, but the D. madagascariensis pot keeps on trucking. It's peeking up above the lights! I like when the blooms reach above the lights. It's cute. I'm glad I've learned how to deal with a bloom on a really leggy D. magagascariensis. Maybe after this bloom I'll do a stem cutting and get it down to size. 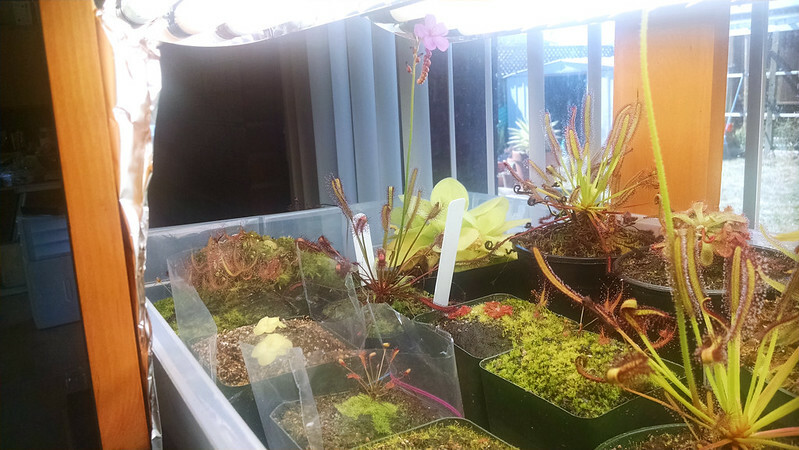 I have an idea for a D. madagascariensis forest for next year's BACPS show, but I've still got some time to prepare for that.